The man who organized the meeting was born in 1927 in Boston. He was the son of immigrants. After struggling through the Great Depression, his family settled in Los Angeles, California, where the boy went to high school. He was exceptionally intelligent — his math skills were off the charts. When he finished high school within two years, he went on to the California Institute of Technology. After getting his degree in mathematics, he got his Ph.D. from Princeton University. The Dartmouth Summer Research Project on artificial intelligence lasted for six weeks. Essentially, it was an elaborate brainstorming session. Five of the attendees of the 1956 Dartmouth Summer Research Project on Artificial Intelligence in 2006. 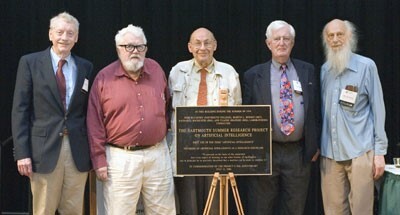 From left to right: Trenchard More, John McCarthy, Marvin Minsky, Oliver Selfridge, and Ray Solomonoff. Photo by Joseph Mehling ’69. Eleven mathematicians and scientists spent their time figuring out how a machine could simulate any (and every) aspect of learning and intelligence. McCarthy’s research focused on making a machine that would be capable of reasoning. In other words, making a machine more human. Have the ability to problem solve. Have the capacity to self-improve. It’s taken close to 60 years for McCarthy’s ideas to become reality. In 2015, DeepMind, a British artificial intelligence company, released its AlphaGo. It was the first computer program to beat a human professional Go player. Go is one of the most complex games in the world. Started in ancient China, it is a 2,500-year-old board game. It’s played by two players, and the game uses pieces called stones. The object of the game is to surround more territory than your opponent. The rules are simple, but the game has complex strategies. Up until this point, a computer could not beat a human. But in March 2016, AlphaGo did it again. It beat the 18-time world champion, Lee Sedol — not once, but four times. AlphaGo won the series 4-to-1. At the 2017 Future of Go Summit, AlphaGo beat Ke Jie — the world’s No. 1-ranked player at the time. After defeating some of the best Go players in the world, the Chinese Weiqi Association awarded AlphaGo with one of its highest rankings. In October 2017, it introduced AlphaGo Zero. AlphaGo Zero beat AlphaGo 100 times in a row. It didn’t lose a single game. What’s more impressive: Unlike its predecessor, AlphaGo Zero didn’t need to observe humans playing against each other to learn. Instead, it started to learn on its own. It started from scratch and had no experts guiding it. McCarthy’s dream was now a reality: A machine can learn. McCarthy had no idea that his brainstorming would one day unleash a breakthrough technology that would change the world. This new tech is projected to increase the global economy by $15.7 trillion over the next decade. It’s going to improve production, decrease downtime and make companies more efficient. AI is already part of our daily lives, and you might not even realize it. Oncologists trained at Memorial Sloan Kettering Cancer Center are using IBM’s Watson — a supercomputer that uses AI and analytics to help companies automate, build powerful models and increase productivity — to help spot eye abnormalities and streamline the process of screening patients for head and neck cancers. Utility companies are using AI to optimize energy production and predict when maintenance could be required on equipment. As a result, production is up by 20% while costly breakdowns and interruptions are down. Energy waste has dropped 10%, saving every American household $30 a month. In manufacturing, AI can improve product design, anticipate part requirements, increase the speed of operations, automate assembly lines, reduce errors and reduce material delivery time by 30%. A 2018 CNBC News study reports that AI will create close to 58 million new jobs over the next five years. One way to take advantage of the huge windfall that’s about to hit global economies is to invest in exchange-traded funds (ETF). ROBO Global Robotics & Automation Index ETF (NYSE: ROBO) gives you exposure to AI. Over time, this ETF should continue to grow. Since I first recommended it on January 24, the ETF has climbed more than 9.5%, outperforming the broad market’s gain of roughly 7%. The ETF holds 29 companies. Some of the companies should do well, but others will struggle. That’s why I’ve spent the past several months researching the one stock that will end up grabbing most of the gains in AI. I will be announcing it in the coming weeks, so stay tuned!